I’ve been having the good fortune of people giving bunches of large vegetables. Not only are the bunches large, but the vegetables themselves…they’re large! Most of those carrots from Pachamama Farm were big daddies! Then, the very next day my husband and I were coming home from a walk and I see my elderly neighbor, Kim, with a large knife cutting away at these giant green onions. Kim sees me and holds out half of her bunch and says they’re for me! Quite exciting! I ran to her and accepted my gift. Kim is always giving me vegetables and I do return the favor when my garden is producing in the summer. In fact, we had a silly thing going on last summer where I gave her a zucchini plant and she insisted on giving me half of all it’s produce. I also had two zucchini plants so I decided I would give her zucchini too. We just kept trading zucchini like that all summer. So I had all these giant green onions and I knew I had to do right by them. I decided to throw it out on instagram (follow me @travellovecook)…give me some ideas for these onions! My sister suggested the ever popular retro midwest card club appeteaser: wrap them in cream cheese and dried beef! Ok, first of all YUM. But oh yeah, that was a joke… My mom suggested slice them in salads. Ok, but I wanted something exciting Mom! As you can see I have quite the instagram following. Finally, someone suggested grilling. Yes! I do a little internet search and I find that there’s this thing in Barcelona called Calçotada . 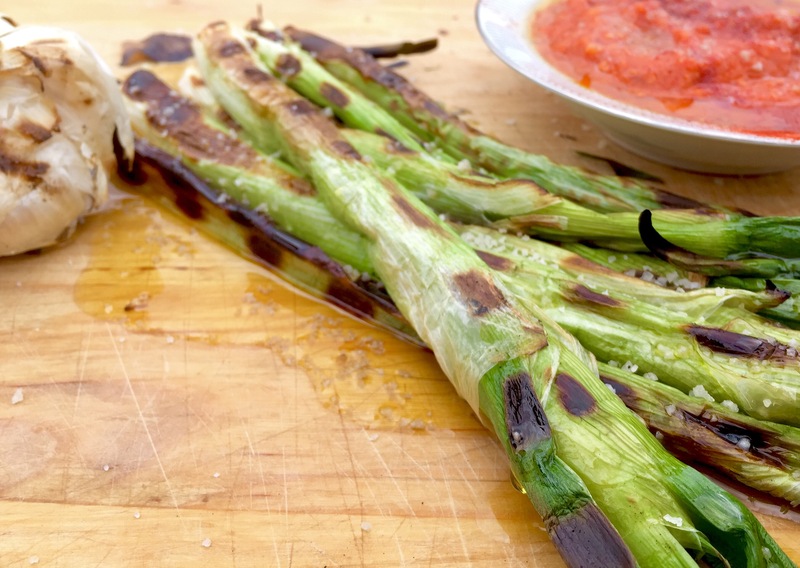 A type of festival every spring where they grill a type of green onion that grows in Spain called “calçot”. Click on that link, and you’ll learn more. So, they char grill these giant green onions and peel away the tough charred outer skin and eat the tender innard. They dip them in romesco sauce a type of sauce with a pepper and almond base. Finally, I had found something worthy of these giant green onion gifts. Make the Romesco sauce first. Heat the avocado oil in a pan over medium heat and then add the whole garlic cloves, still in their skin. I did this because I wanted them to have a roasted taste and not browned at all. Saute for a couple of minutes and then add the onion and some salt and pepper. Cook for about 5 minutes over medium heat stirring frequently. You don’t want the almonds to burn at all! Next, add the breadcrumbs and the smoked paprika. Cook for about another 1-2 minutes. Take out the garlic cloves and remove the garlic from the skin. Transfer the garlic and the rest of the ingredients in the pan to a food processor. 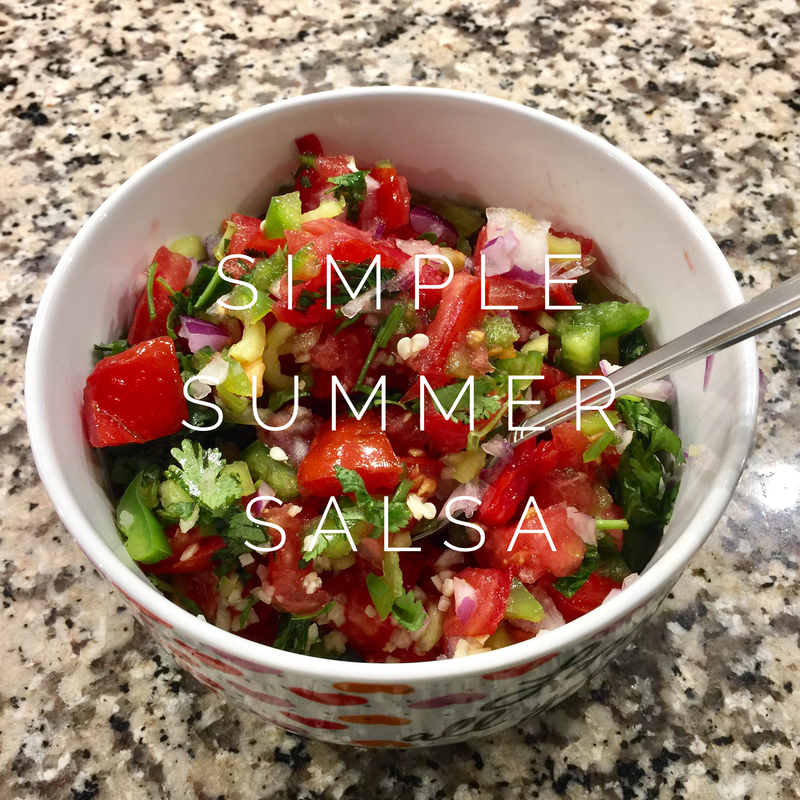 Also add to the food processor the tomatoes, the chile peppers, red wine vinegar and about a teaspoon of salt and ½ teaspoon of pepper. 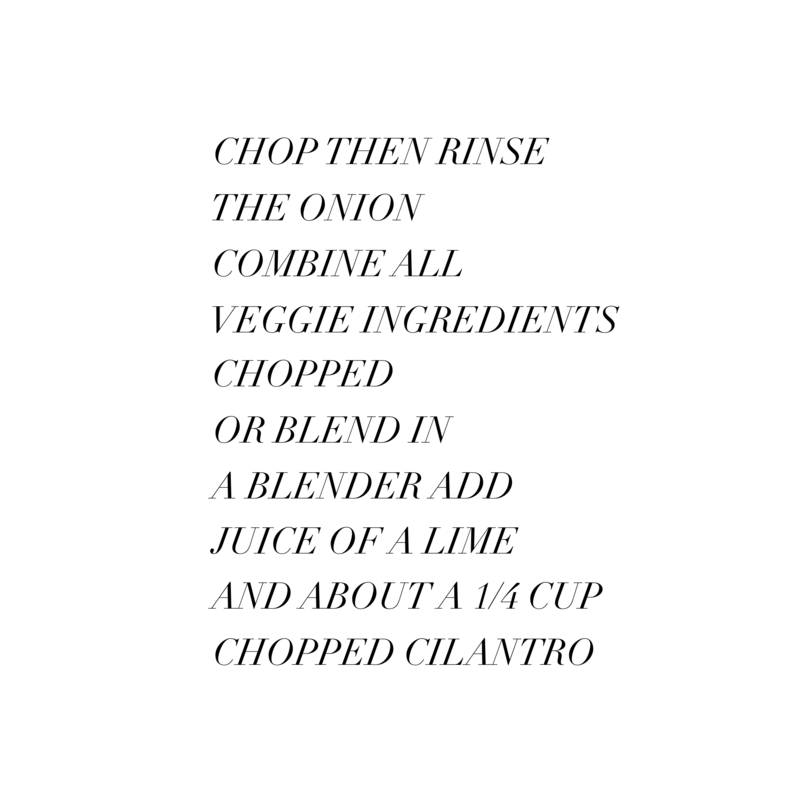 Blend all the ingredients. It will take a while with those whole almonds. Then start slowly pulsing in your olive oil. The sauce should be blended but small chunks of almonds are fine and even quite pleasant. Taste the sauce and adjust the salt and pepper and even add a little more vinegar if you want. I heard once that sometimes when you think that certain something is missing and you don’t know what it is, a splash of vinegar is what you need! You will have lots of leftover Romesco sauce. That’s ok because you can use it for whatever! I tossed it with penne and that was good but I think some linguini would have been even better! Back to the calçots. Heat Your grill. You want the final temperature to be around 450-500 degrees. Wash and dry your green onions. Lay the on the hot grill. Leave the grill open. Just stand there now and don’t go do anything else because you may get distracted. Once one side is quite brown, use tongs to flip them over. Don’t try to use those giant, awkward grill tongs. Use tongs that you use inside and you’ll be much more dexterous with them. You’re going to get pretty mad if you drop one through the grates. That’s why you want to use very large green onions. Once, the other side is very brown too, almost black, they are done. Put them on a platter and drizzle with olive oil and sprinkle with course salt. 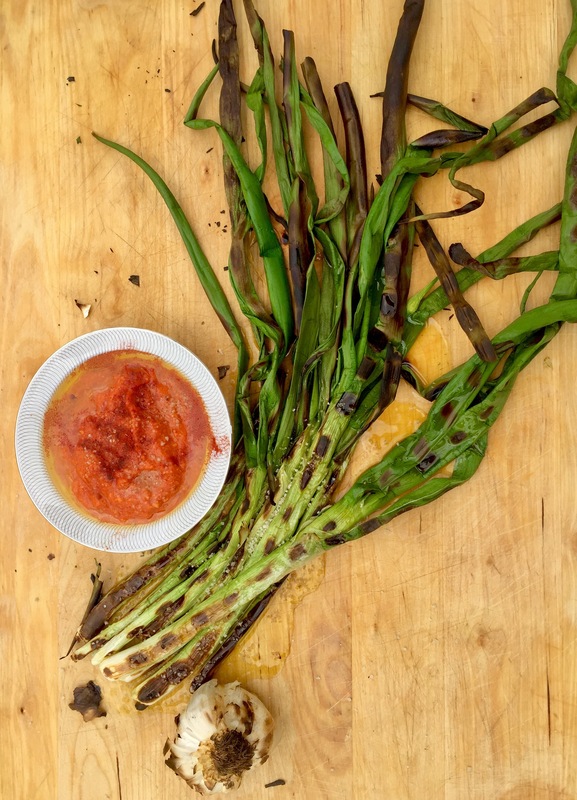 Serve the calçots with the romesco sauce. Drizzle the romesco sauce with more olive oil and a sprinkling of course salt. Now peel away that outer layer, dip in the romesco, and enjoy all that delicious mess. I’ll admit that I’m a little late to the oven roasted tomato scene. I’m sure this has been popular for a while but I didn’t try it until about 2 months ago. I had some kumato tomatoes and decided to try oven roasting. Fantastic. It’s that umami flavor that I love. They were so good that I couldn’t wait to get home when I was away from them. Slow roasting takes away the excess water and intensifies the flavor. Intensely tomato. 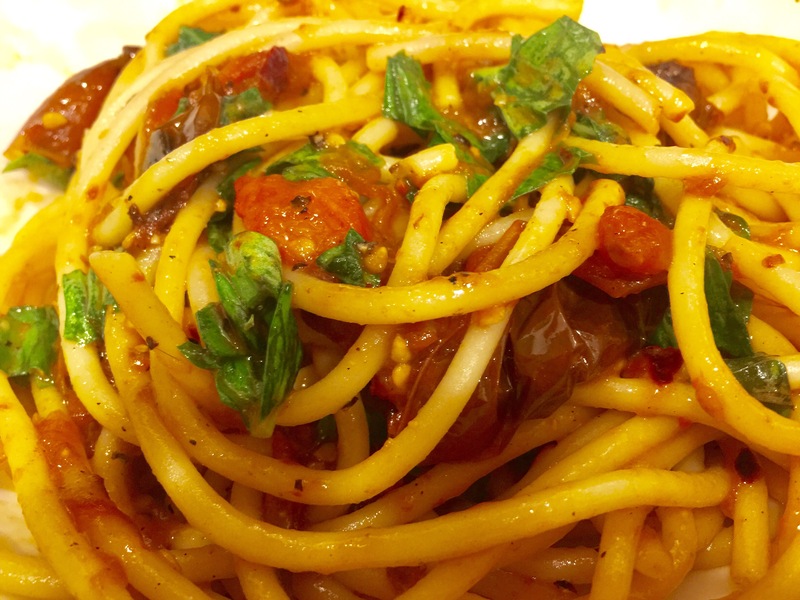 Oven roasted tomatoes are amazing spread on toast, in pasta, salads, and just on their own. Kumato tomatoes are already quite an intense tomato flavor and sometimes the best choice when all other tomato varieties are flavorless in February. Oven roasting tomatoes is really best in the summer if you have a garden with an excess of tomatoes. Keep them in a jar covered in olive oil and they will keep for a couple of week in the fridge. My recipe is simple and with limited ingredients. You can add chopped garlic if you like or fresh herbs such as thyme or oregano. course salt for sprinkling such as kosher or course ground Himalayan salt. Preheat your oven to 250 degrees. Wash the tomatoes and slice in half the long way. 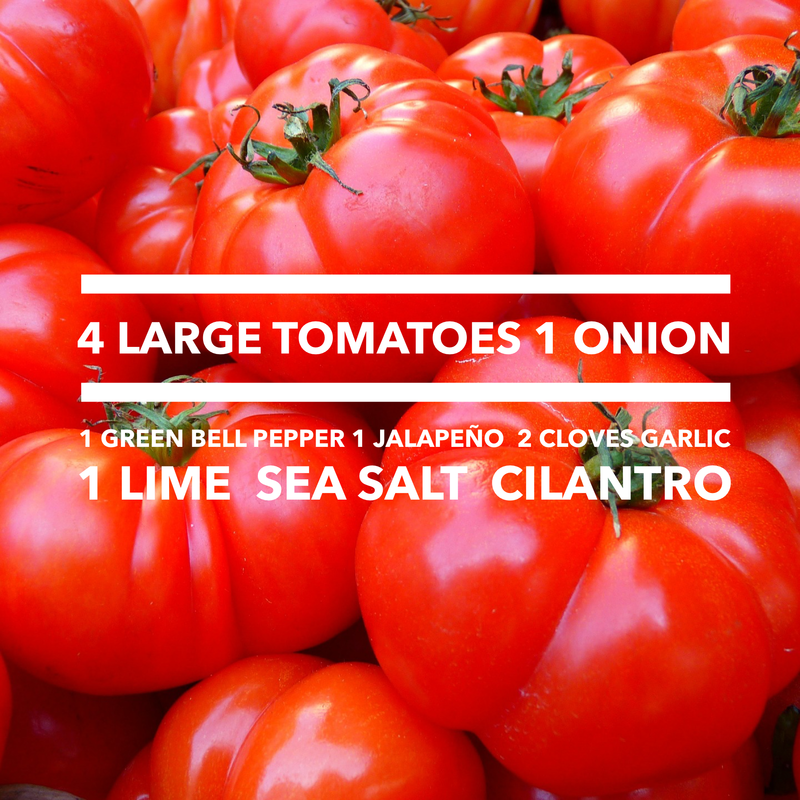 This helps to keep the flavorful seeds and juice inside the tomato halves. Spread wax paper on a baking sheet and lay out the tomato halves, cut side up. Drizzle with olive oil and sprinkle with salt. Roast in the oven for 4-5 hours. Store in a container with a little more olive oil to help preserve them. I tossed them with bucatini and fresh basil. How do you use them? Let me know if you make these, or have made these! 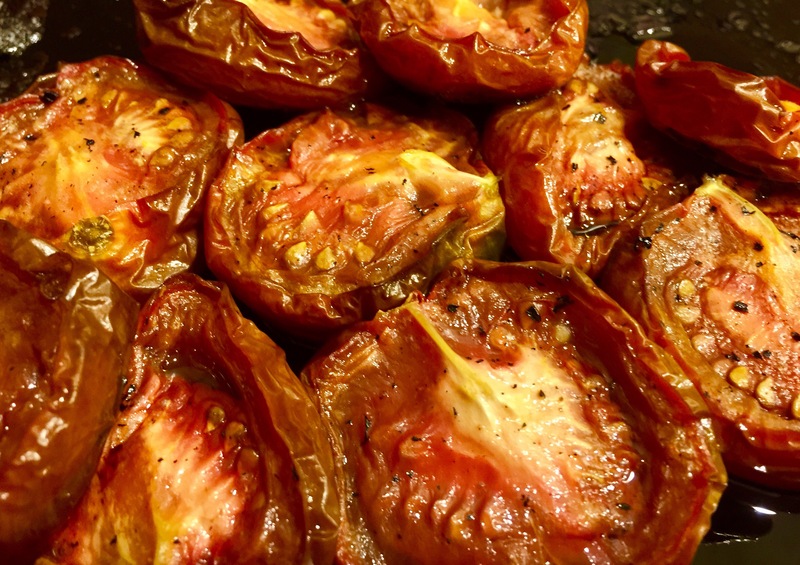 Comment below and let me know what you think or share your favorite way to use oven roasted tomatoes.